Something I thought about after Monday’s piece on AT&T’s debt is how many other blue chip stocks are in a similar position right now. The one that instantly came to mind was a stock that I covered just a few weeks ago: brewing giant Anheuser-Busch InBev (NYSE: BUD). Now in many respects the situation at Anheuser-Busch closely resembles that of AT&T. For a start both are absolutely mammoth corporations: between them they generate something like $200+ billion in annual revenue and $20 billion in net profit. In addition both have seen huge increases in balance sheet leverage in recent years as a result of large scale acquisitions. Anheuser-Busch InBev has been involved in three deals that have topped $20 billion in the past decade, the most recent being last year’s buy-out of SABMiller. AT&T will have done something like $140 billion in M&A activity within a four year stretch assuming the Time Warner deal eventually goes through. In both cases the end result has seen total balance sheet debt levels balloon well beyond the $100 billion mark. Similarities aside there is one interesting difference here that is worth thinking about: the contrasting attitude of management with respect to dividends. In the case of AT&T they are pretty much signed up to maintaining current levels of spending on the distribution. Not only that but it seems that the intention is to plough on with the progressive annual per-share raises that shareholders have gotten use to over the years (even if those increases are largely symbolic in nature). 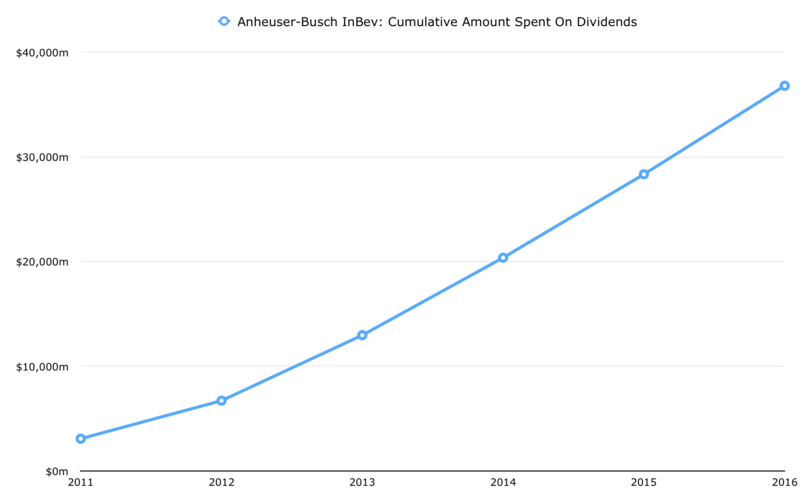 Anheuser-Busch, on the other hand, seems to be far more open to the idea of a dividend cut in order to prioritize debt reduction. Understandably a large proportion of shareholders tend not to be too keen on that idea. In the case of AT&T this seems to be pretty understandable. After all a huge number of folks own the shares precisely because they are seen as a bond proxy – a reliable source of yield in a world where traditional safe heavens (savings accounts, US Government paper, and so on) aren’t offering much at all. 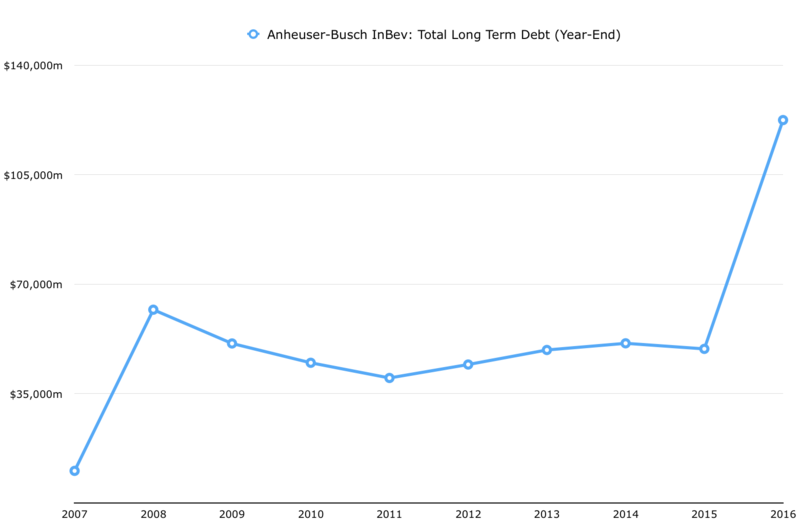 As for Anheuser-Busch, well, speaking as a shareholder I’d actually be quite happy to see the dividend cut in order to free up more cash for debt reduction. To better explain why let’s consider the overall cashflow situation with respect to the cost of debt. As it stands the total debt pile clocks in at around $120 billion gross. Throw in the $10 billion or so in cash & short term investments and we’ll call it $110 billion in total net debt. Now, according to Anheuser-Busch’s Q3 2017 results the 2017 interest bill on that will be somewhere in the 3.5%-4% region. Just to err on the conservative side of things I’ll go with the upper bound figure, which in cash terms equals an annual expense of somewhere around $5 billion. To put that figure into some context analysts currently have earnings before interest, taxes, depreciation and amortization (EBITDA) coming in at around the $22 billion mark in 2017. Going forward we can expect to see some gains from the SABMiller deal coming through which would push that figure up to $25-$26 billion by fiscal year 2019. Management’s long-term net debt target is 2x EBITDA – so let’s call it somewhere between $45-$50 billion based on likely 2017-2019 EBITDA. In other words to get from where Anheuser-Busch is now to where it wants to be requires around $50-$55 billion in net debt reduction. After stripping out interest, taxes, capital expenditure and the current level of dividend spending the company will probably be throwing off surplus cash (i.e. post-dividend free cash flow) of just over $5 billion by the end of 2019 – or roughly 10% of that total debt reduction target. Slashing the dividend by 50% – which would leave a token yield of 1.9% based on the current share price – might well ruffle a few feathers, but it would also boost that annual surplus cash figure to almost $10 billion. Here’s where a rapid debt reduction strategy becomes appealing. In terms of the annual cost on management’s $45-$50 billion net debt target we’re looking at around $1.5-$2 billion if we use 2017 interest rates. Or put another way that would be annual savings of around $3 billion compared to current levels of interest payments. In terms of Anheuser-Busch’s bottom line that represents a potential tailwind of around 25% based on analyst estimates for 2018 earnings. As I said in the AT&T piece, seeing that cash ultimately go into shareholder pockets rather than bondholders’ seems to be a prize worth going for, even if it does require shorter-term dividend sacrifices in order to get there quickly.